Celebrating 30 years of gcp! As part of our 30th anniversary celebrations we published a book to tell our story and showcase some of the fantastic projects we have been lucky enough to be involved with over the years. Click here or on the image below to read the book! Our project for 6 new family homes at Othery Somerset, was handed over in December and is now occupied. A rural exception scheme located adjacent to a busy road on the edge of the village, the development was granted planning in July 2016 after extensive consultation with the Parish Council and Local Planning Authority. An innovative construction method was used in the construction and following completion of highway improvements, the houses were constructed swiftly to a high standard by Man Green Solutions. gcp developed early energy modelling and assisted in developing an innovative solution to energy efficiency in the new homes which include high performing building fabric combined with simple systems for heating and hot water. The innovative ‘Velox’ Insulated Concrete Formwork construction system means the homes are highly insulated and achieve an airtightness of 0.99 m3/m2/h – well above the standards of conventional construction. As a result, heating demand is minimised, making simple electric heating efficient and cost effective. Each home is provided with a large Photovoltaic array at roof level, providing free electricity for heating and hot water. The house systems include smart energy management and battery storage to ensure all energy generated by the Photovoltaic panels will be used in the home (rather than being exported to grid as is common). This means the tenants will enjoy warm and comfortable homes and should have near zero energy costs for heating and hot water. South Western Housing Society will monitor costs and performance of the homes and it is hoped this project could be a model for more low energy homes for the future. Our latest PassivHaus project, a private house in an exposed location at Dundry completed first stage airtightness testing before Christmas. This is a key stage for PassivHaus projects, testing airtightness on the building envelope before starting second fix. Ensuring the building is adequately airtight at this stage should ensure that final airtests are likely to be achieved. The PassivHaus requirement is 0.6 ac/h. Testing carried out by Paul Jennings of ALDAS showed the building flew through this stage, achieving 0.3 ac/h - a testament to the (self-build) client’s attention to detail and the robustness of the ICF construction method. Detailed planning has been submitted by gcp Chartered Architects for the redevelopment of a 1960’s office building in the heart of the city of London, just off High Holborn. The project comprises of adding two new floors on top of a four-storey concrete framed building on an extremely confined site accessed via a doorway off High Holborn 2.5m wide and 5.2m high. The challenge of this limited access has driven all the design decisions for the scheme. The project for Courtenay Investments Limited will be developed to CAT A Standards and will feature 16,700 sq ft of office space over 6 floors designed to offer maximum flexibility in letting. It will be a significant improvement on the current very tired building that offers only 11,500 sq ft of poor quality office space. The scheme is due to start on site in Spring 2018 with a planned completion by December 2019.
gcp has submitted a planning application for 16 affordable dwellings in Oldbury Court, Bristol, where we are working in partnership with Dribuild Ltd and United Communities Housing Association Ltd. The proposed buildings are located on the site of a former community centre which has been derelict for a number of years. We have produced some great CGi’s which is a service we are able to provide in house. Please contact us for more details. gcp are pleased to announce that we successfully passed the CyberEssentials certification. BV Dairy are a widely respected, independent milk processor based in North Dorset selling a wide range of speciality products such as soft cheese, yogurt, clotted cream and mascarpone. Operating since 1958, the company has grown steadily whilst maintaining the traditional values of a local, family run business. As a consequence of incremental development of the site, more stringent regulatory controls and higher supplier production standards, gcp Chartered Architects were appointed in early 2013 to devise a development strategy for the site. The strategy focused on improving product flow, operational efficiency and opportunities for future development. In late 2013 gcp submitted and secured planning approval for a wide range of improvements across the site, which included simplifying vehicle movements and increasing on site HGV parking, development of new production space, dedicated storage, improvements to product flow around the dairy and provide much needed additional administrative accommodation. The first major project developed was a state of the art 1800m2 1000 pallet temperature controlled storage facility comprising of loading bays, offices, meeting rooms and an engineering workshop. The cold store was delivered following detailed planning approval secured in July 2015. The scheme included a sustainable drainage system (SuDS) involving permeable block paving and surface water run-off from the building roof directed through a series of berms, swales and basins, allowing gradual percolation back into the soil. The building also hosts 222KW of solar PV array on the entire roof. The project opened for business at the end of 2016. The Public Consultation event at Brent Knoll last week was well attended. gcp were on hand to explain initial proposals and listen to local community members concerns. Our task now will be to come up with detailed proposals that address as many of the issues raised as possible to produce a development of low cost homes for local people. A Healthy City Week 2016 event organised by gcp Chartered Architects has created a far ranging multi stage research project between University of the West of England Enterprise Studio and Ambition Lawrence Weston. The project will look at the benefits the Lawrence Weston Community Hub will bring to the people of Lawrence Weston. The hub comprises of a range of public and voluntary sector services including a gp practice, pharmacy, public health offices, library, community rooms (meetings, dance, exercise etc), shared consulting rooms and office space for Ambition Lawrence Weston. The project, to be undertaken by a number of Masters interns in successive years, will examine the benefit the hub is expected to deliver concerning community health and well-being. The project will look at three clear phases to the project, namely before, during and after implementation of the Hub with the first year of the study essentially a baseline and planning year. “Having been part of the original group that managed to safeguard the development site for the hub, we are delighted the potential benefits of such an intervention (the hub) are central to this research project. So often capital investments are committed without hard evidence as to the real benefits the idea will deliver. Hopefully this research will demonstrate that such One Public Estate projects can bring real benefits to both public finances, but also the host community they are designed to support”. The project is expected to start on site in early 2018 with a planning completion before the end of the year. St Monica Trust is a long-established provider of retirement accommodation in Bristol offering over 55 flats on lease hold or a rental basis to long term nursing and dementia care. They operate five sites in and around Bristol, with their Cote Lane site in North Bristol forming the hub of their activities. The Cote Lane site, established in 1924 by the Wills family, now provides accommodation for over 320 residents in a range of fantastic buildings within a beautifully landscaped nine-acre site. The site also accommodates the Trust and over all the sites employs over 500 staff including care, hospitality and administrative functions. gcp Chartered Architects have been appointed to develop a far ranging Five-Year Enhancement Plan for the site. The Enhancement Plan is looking to upgrade many of the on-site facilities and create an ‘open retirement village’ where the gym, swimming pool, coffee shop, restaurant and hall are open to local people, schools and businesses. The Trust is ambitious and is keen to future proof the site by ensuring it continues to provide sector leading facilities and standards of care. If approved by the trustees the works will be delivered over a five-year period starting in 2018. During 2017, gcp supported the Trust with the development of B Block and Somer Dining, a restaurant forming part of the £60m Chocolate Quarter development in Keynsham. new homes for local families in Pilton get the thumbs up! 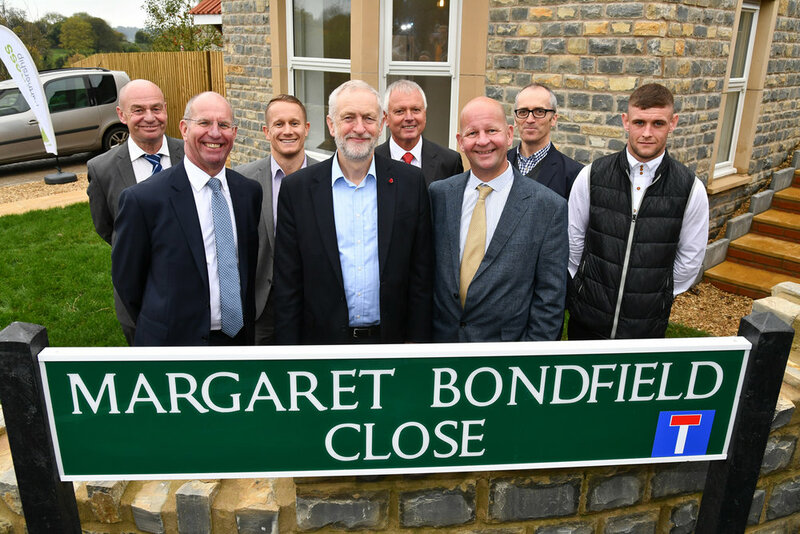 Recently completed, Margaret Bondfield Close in Pilton received some important visitors this week. Michael Eavis and Jeremy Corbyn toured the site and met new residents to look around the houses and give the scheme their seal of approval. Land for the development has been provided by Mr Eavis, along with local stone from Worthy Farm quarries. The development provides 13 affordable homes for local families, developed by Guinness Partnership and constructed by EG Carter Construction. 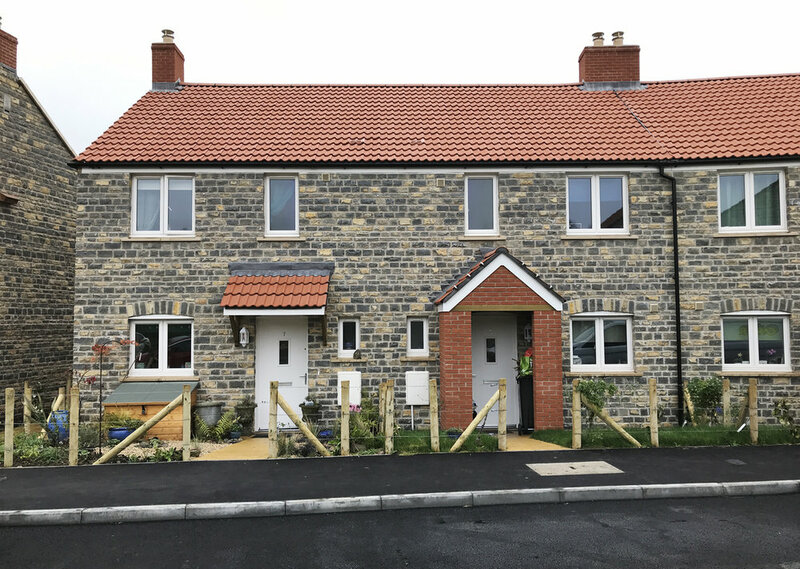 All the visitors were impressed by the size, quality and character of the homes designed by gcp Chartered Architects to reflect the character and typical details of Pilton Village. gcp worked closely with Guinness Partnership and EG Carter through the Public Consultation, Planning and Construction stages of the project. St Monica Trust have invested over £60m in the redevelopment of the former Fry’s chocolate factory in Keynsham (between Bristol and Bath) in creating a new retirement community, The Chocolate Quarter. As part of the soft launch and pre-opening staff training, staff at gcp enjoyed a wood-fired pizza in B Block, the gcp designed bistro / bar that forms a suite of facilities open to the public. B Block and sister restaurant, Somer Dining, will open on Monday 6th November. Following on from their work at The Chocolate Quarter, gcp Chartered Architects have been appointed to develop A Five-Year Enhancement Plan for the Trust’s prestigious Cote Lane site in North Bristol, the jewel in the Trust’s crown. We’re delighted to say that we raised over £1,000 at our gcp Charity Quiz in aid of Macmillan Cancer Support. Thank you to all that came along and donated to such a great cause. gcp is delighted to welcome Bruce French to the team. Bruce joins us straight from the University of the West of England where he has just successfully navigated a Bachelor of Arts in Architecture and Urban Planning. When he is not hard at work, Bruce likes nothing better than popping a tinnie and riding the Cornish waves on his surfboard. It is Bristol Open Doors http://www.bristoldoorsopenday.org.uk/ this weekend and gcp are supporting Trinity Community Arts https://www.3ca.org.uk/. We have developed a long term masterplan of the site and you can visit the centre on Thursday 7th September and Sunday 10th September between the hours of 10am and 4pm. gcp is delighted to announce that Esther Brown has joined the team. Esther has just finished her Part 2 Masters in Architecture at Canterbury and has previously worked for Atkins. Twenty two teams battled it out and we managed to raise about £750 for the charity. A showcase for our low energy design of six houses in Othery, Somerset. gcp director Colin Powell supported South Western Housing Society and Man Green Solutions showcasing our scheme at Othery this week. The scheme, currently under construction, is being built using an innovative construction system from Austrian Manufacturer Velox. This is our fourth project using Insulated Concrete Formwork – a system we believe can deliver very low energy and high quality homes with a speedy construction. The project will deliver 6 new affordable homes with extremely low energy bills, that are comfortable and easy to run. The construction system was explained by Man Green’s Director Ian Bartlett and his site team who will be delivering the completed homes by the end of the year. The invited audience of Housing Associations and Developers were all very impressed with the robustness and simplicity of the construction system and we expect to see more projects being developed with this innovative approach. We have worked with Ambition Lawrence Weston to secure a site for the development and attract funding for a detailed planning application. One of our largest housing projects to date, this £45m development will provide 127 new homes in North Bristol.